When considering this type of project first identify where you want to use the blocks. Then determine what glass block sizes and shapes are best to finish your straight or curved wall. There are blocks to make a round turn, a 45 or 90 degree angle or finish the end of a wall. 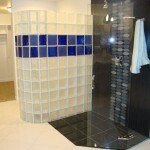 The colored and frosted glass blocks are available in all the various sizes, shapes and patterns. Although you can make the entire wall colored in most instances people use these blocks as accents, stripes or randomly throughout the wall. Prefabricated wall sections can make your installation easier, improve the finished quality and save on the project cost as well. These wall panels use a system called vinyl stack which are placed both horizontally and vertically through the wall sections. Then anchors are inserted into the vinyl stack sections to tie the walls into your existing wall(s). If you’re not comfortable installing a shower enclosure or partition wall yourself consider a bathroom remodeling contractor, tile contractor, or glass block contractor to perform this work. 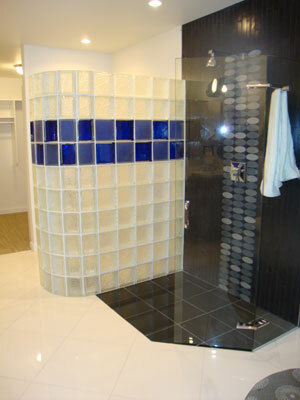 Do you have a project where you’re considering the use of colored or frosted glass blocks that I can help you with? Please comment below with any questions, thoughts or ideas you have. If you need any help with colored or frosted glass blocks or want a quotation contact Columbus Glass Block (614-252-5888), Cleveland Glass Block (216-531-6363), or Mid America Glass Block (513-742-5900) of Dayton and Cincinnati. Kenny – I’m glad this post was of value to you. What type of college assignment did you have? Can I help further?